With his latest EP Wave[s], 24-year-old Chicago MC Mick Jenkins is continuing to build on the success of his critically acclaimed mixtape The Water[s]. While Jenkins had already been issuing music for a few years, the 2014 mixtape garnered him an expanded fan base and got him on the radar of critics. Showcasing Jenkins' powerful baritone voice, the melancholy bent of tracks like "Martyrs," "Jazz" and "Comfortable" drew plaudits for their willingness to tackle social issues head on while also being introspective and cerebral. Wave[s] is a project that draws on a different sound and approach. "I think it's doing exactly what we wanted it to do, and that's to acquire new fans and get people turned on," Jenkins tells Exclaim! a few days after Wave[s]' recent release. "I definitely wanted to make a statement and let it be known that what people came to love on The Water[s] is not all I can do. And that's not what I will do throughout the course of my career." While Wave[s] features hard-hitting lyrical exercises, it also finds Jenkins speaking outwardly about romantic relationships and features decidedly brighter soundscapes than The Water[s]. One example is latest single "Get Up Get Down." "It just makes people feel good," Jenkins says. "It just makes people want to put their hands up. And that's what we've seen when performing it. I've been performing 'Get Up' for a while, even before we released it, and even in the moments it was brand new to a room of 500 people, people love the song. It feels good. We're definitely conscious of that. I feel like we had a strong set before, but with all the new music from Wave[s], it just adds other dimensions on how we can control the feeling in the room and really take people on a ride and give people an experience." The different sound on Wave[s] for Jenkins came from employing a new creative process in the studio. "It's not a full-length; it's not a follow-up," says Jenkins. "It's just an EP. That's how we treated it. I think previously we made music like we did for The Water[s] and then doctored it and changed it and then adjusted it to fit this concept — and to realize a concept for the listener — and with Wave[s] we just did exactly what we were feeling and we weren't bound by any concepts so we kept that in mind. That's why the songs are short. That's why there isn't a concept, that's why we focus more on the feeling rather than delivering this overall powerful and ominous message." One of Jenkins' collaborators on Wave[s] is fast-rising Montreal producer Kaytranada, who produced the alliterative standout "Ps & Qs" on Wave[s]. "I actually met Kaytranada in a poutine shop," says Jenkins, a frequent visitor to Montreal (as outlined on "514" from The Water[s] mixtape). "That was dope. We just rolled up on him and we've come to be pretty good friends. We're not always in a space to work together in the same studio, which is killing me, but we see each other a lot." Kaytranada is not the only other Canadian talent Jenkins has been working with. Recently he teamed up in the studio with BADBADNOTGOOD, and he hopes to reconnect with the jazz trio for extended sessions as he works on his upcoming album The Healing Component. "The Healing Component itself is love, brotherly love. Agape. In its purest form what Christ was able to show us, right? And a lot of the world's problems could be solved with love. That sounds like a really cheesy simple answer — and it's never that simple — but that's what I intend to explain on that album and Wave[s] coming right before that. Not only was I inspired by actual love, but I just felt it necessary to get that in there somewhere, have people wonder why I'm talking about it and when The Healing Component comes out, watch it come full circle." 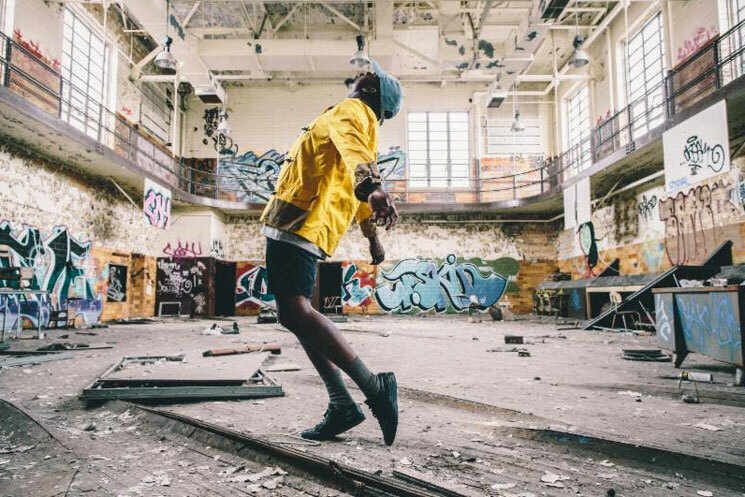 Mick Jenkins just kicked off a North American tour over the weekend and will be playing Toronto on September 1 at the Hoxton, Ottawa on September 2 at Ritual and Vancouver at Fortune Sound Club on September 27. You can see the full run of dates here.